I wrote before about the Green Party’s chances of beating the Lib Dems (in terms of vote share) in the up-coming euro elections and found little polling evidence to back up the Green’s claim that they will. 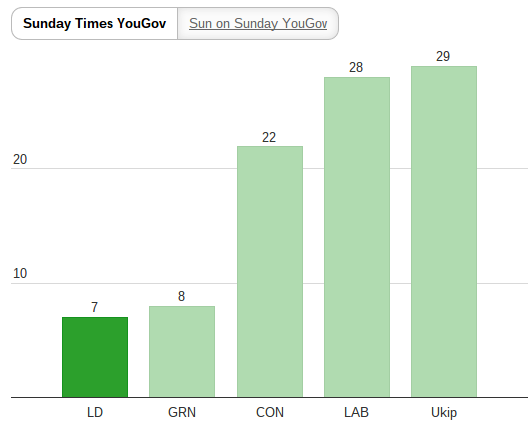 It seems only fair then to point out that today a new poll has been released (YouGov Sunday Times voting intention) that puts The Green Party ahead of the Lib Dems. As far as I am aware this is the first poll to have these headline figures making it worthy of observation for Mike Smithson over at Political Betting. More good news for The Green Party came from the 18 to 24 age range which had the Greens on 17% and in third place, ahead of UKIP (11%) and Lib Dems (6%). Either way, as I argued before, The Green Party are on course for a good showing at the European Elections and the Lib Dems are simply trying to avoid disaster!